lower right in graphite: Frank Short to Martin Hardie; lower left edge in graphite: Part of "Sunrise o'er Whitby Scaur". / (S.220.) / Proof of the plate published in / F. Short's "Etchings + Engravings", 1910. / only 2 or 3 proofs were printed. 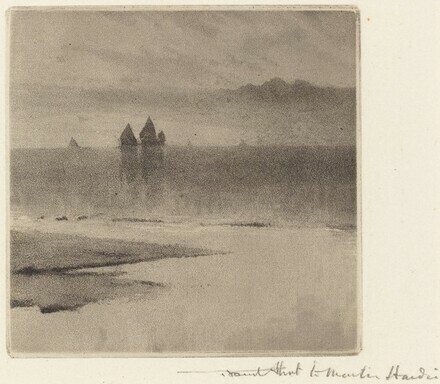 / M. H.
Hardie, Martin. The Etched and Engraved Work of Sir Frank Short, vol. 2. London: Print Collectors' Club, 1939, p. 50, no. 156. Strange, Edward F. Etched and Engraved Work of Frank Short, A.R.A., R.E.. London: George Allen & Sons, 1908, no. 220.